Now that we have a pretty set trend line of NC absentee mail ballot requests, by comparing the totals by day out from Election Day of 2018 to 2014, to say that interest in this year’s election is up may be an understatement so far, especially with a blue-moon election. 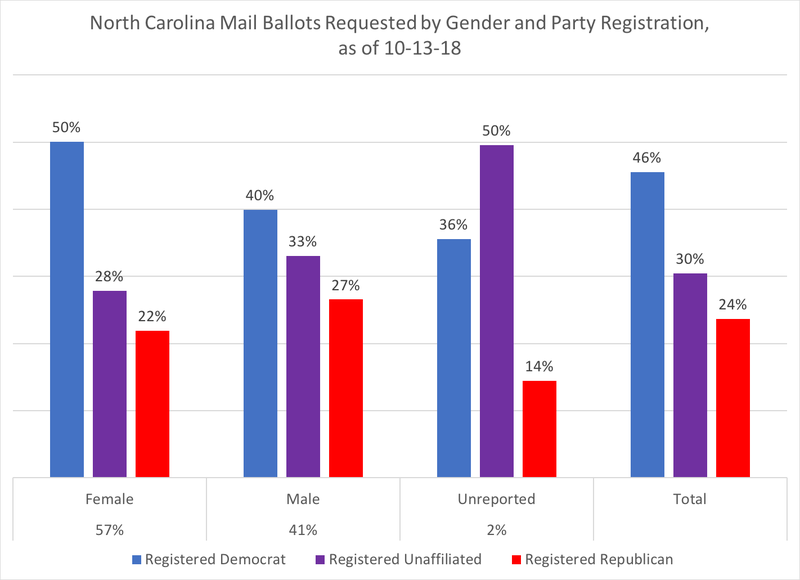 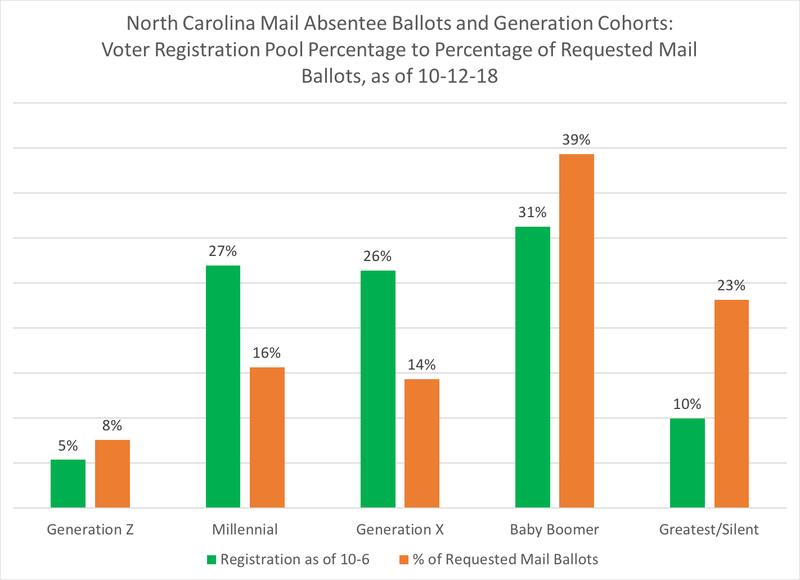 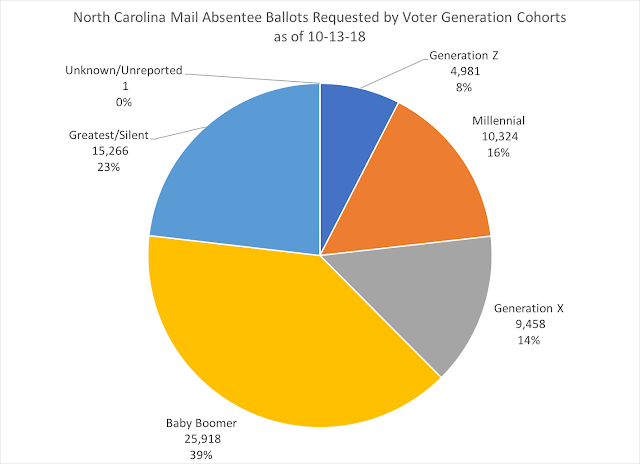 What is interesting is that Generation Z voters (those 21 years old and under) are over-performing their voter registration percentage, but the bulk of mail absentee ballots are from Baby Boomer voters and older, which is the traditional pattern for this vote method in NC. Note that a continued plurality of 2018's mail absentee requested voters were registered before/in 2014 but didn't vote in 2014's general election. 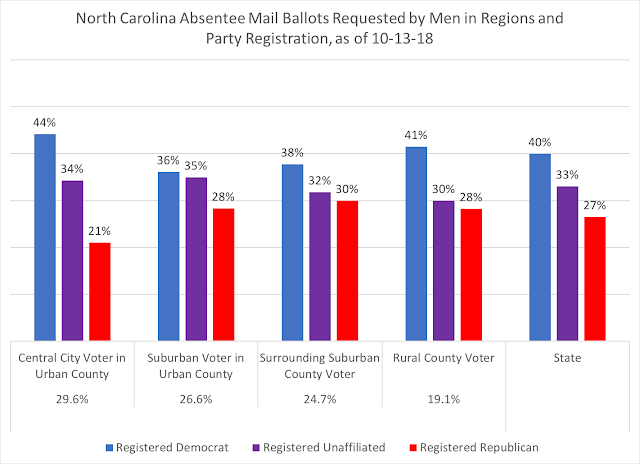 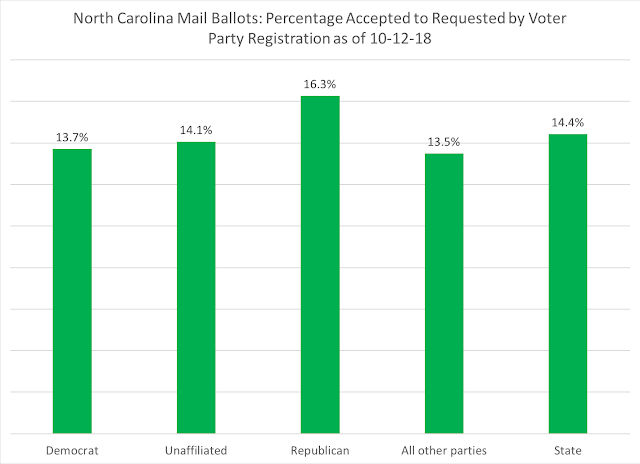 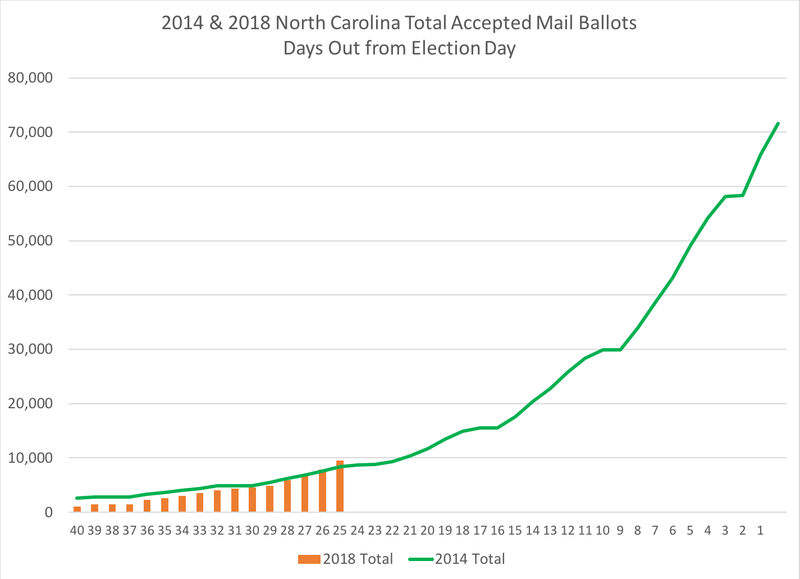 It seems like (maybe an understatement) a LOT of new voters using NC’s absentee mail ballot voting method, based on this data. Female voters are 57% of all requested ballots (a new high %), while male voters are 41% of all requested ballot. Another important aspect: 50% of women are registered Democrats. 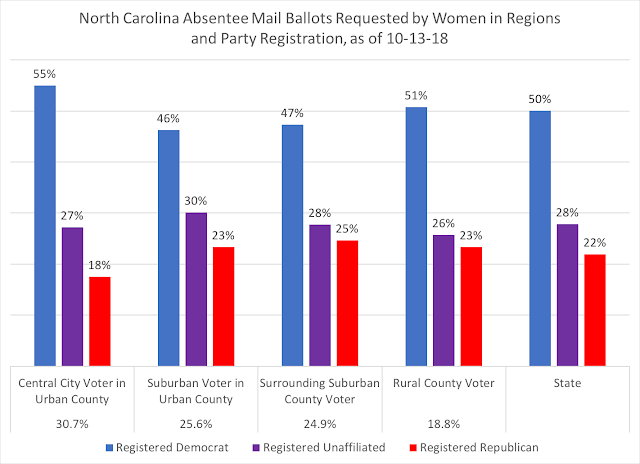 Note: suburban voters (both female & male) are 50% of the requested absentee mail ballots (those living outside central city but inside urban county + surrounding suburban counties). 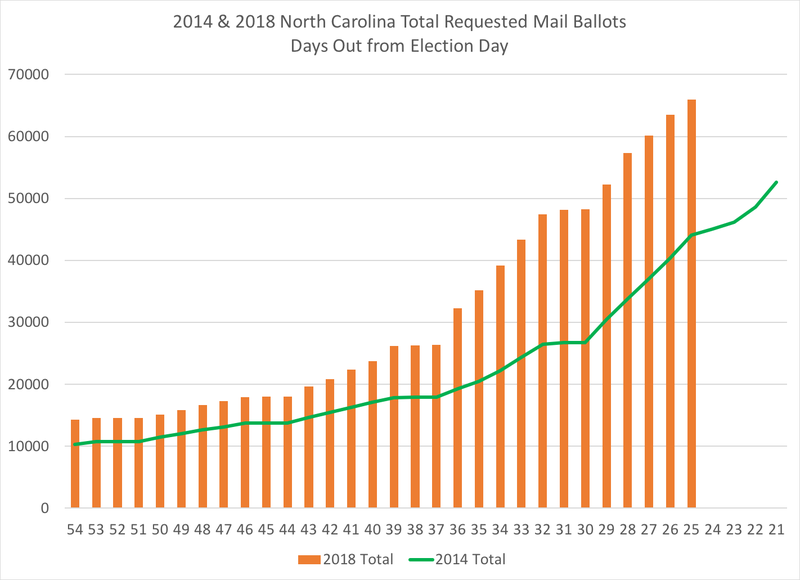 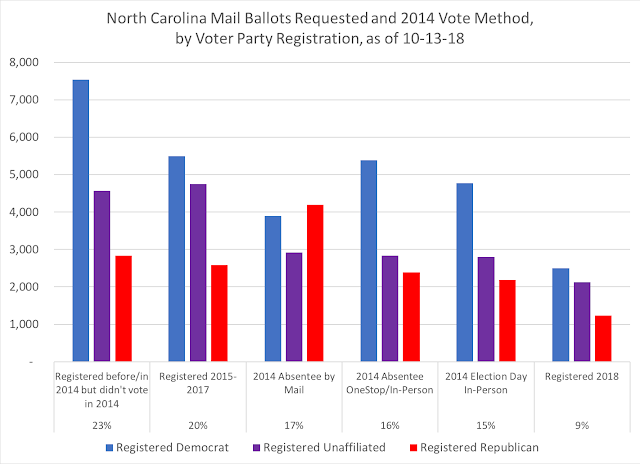 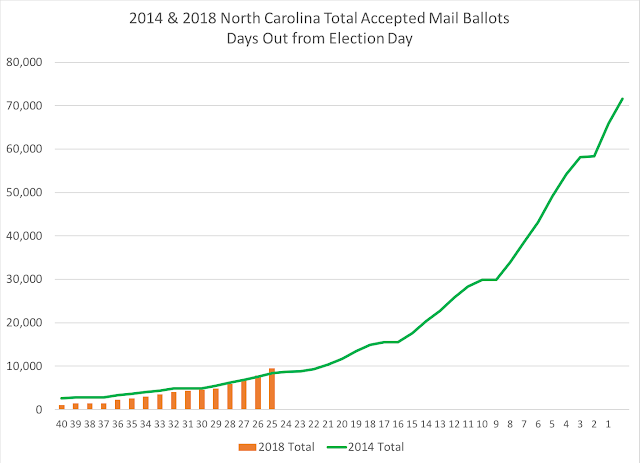 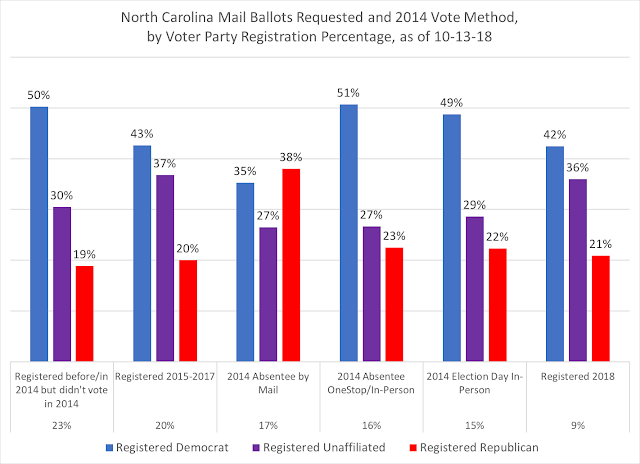 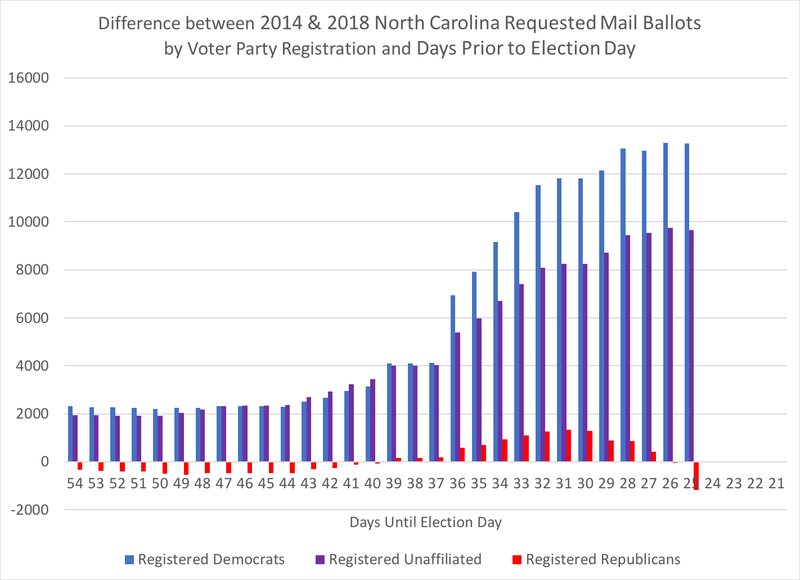 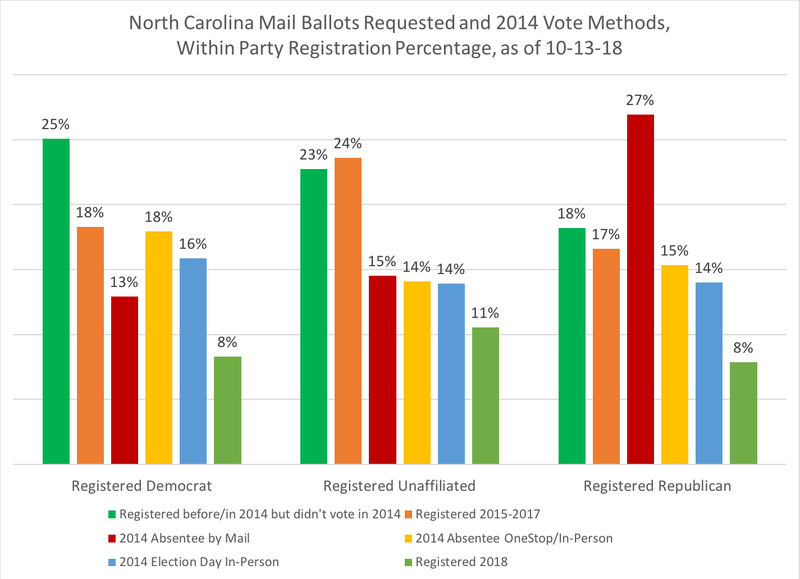 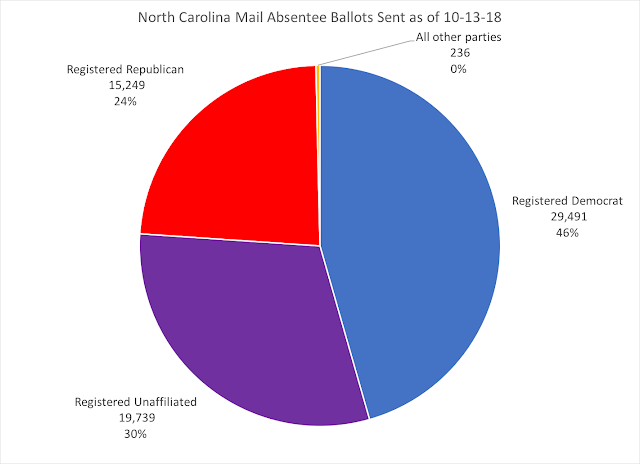 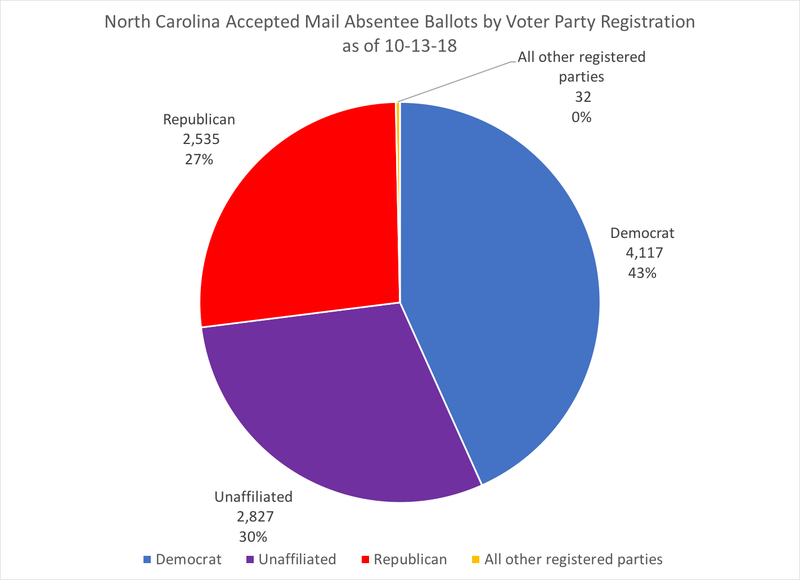 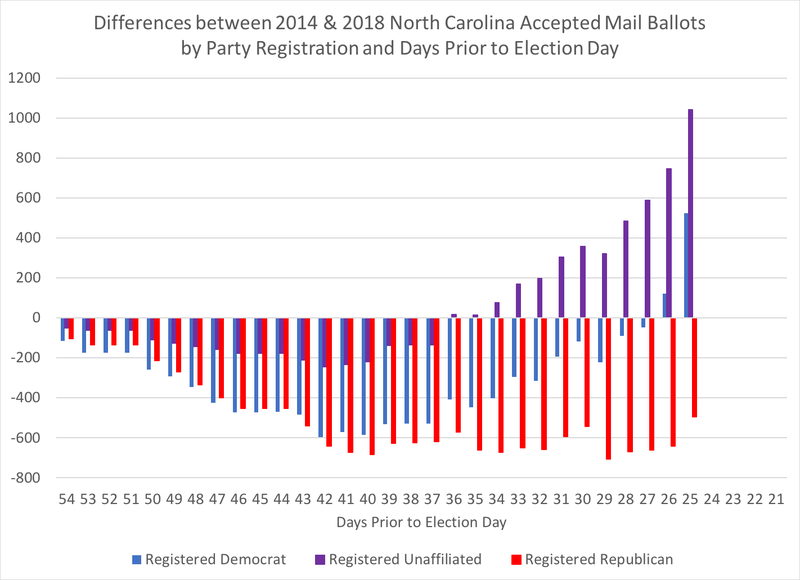 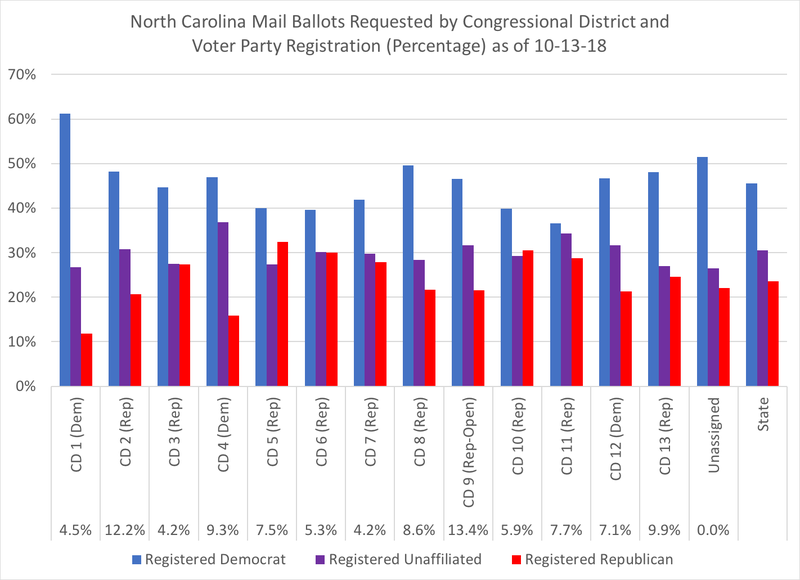 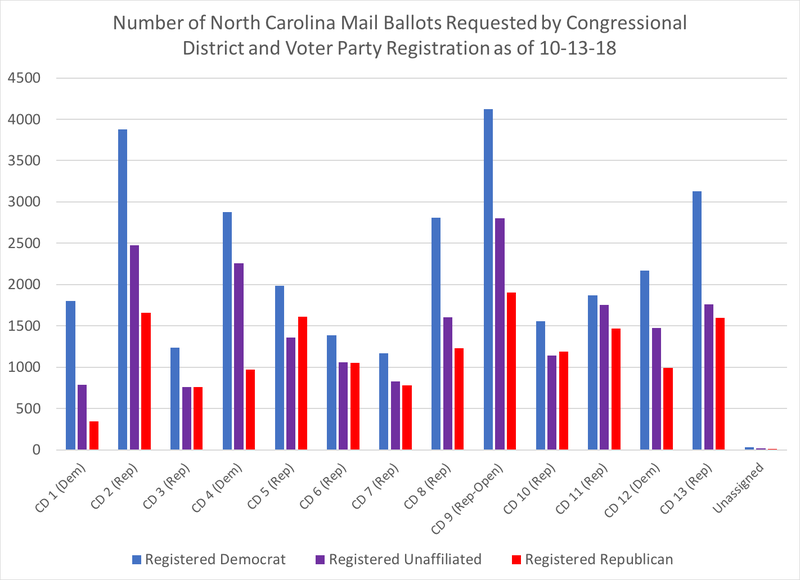 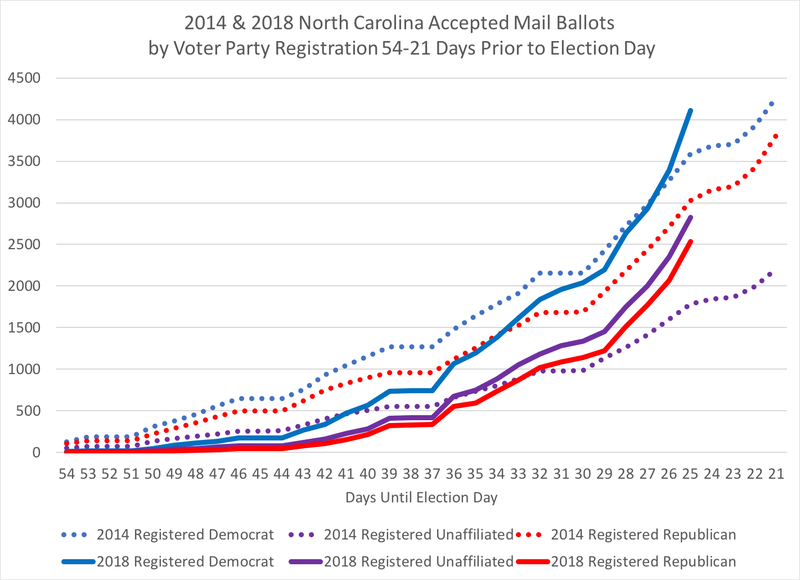 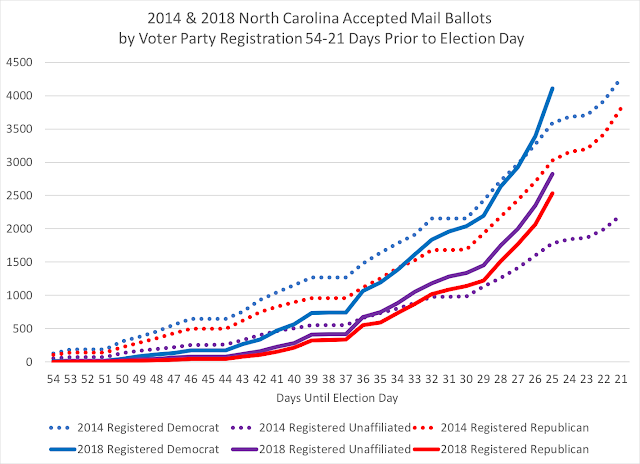 Comparison between 2014 and 2018 NC mail absentee ballot requests, by party registration, based on the number of days out from Election Day. 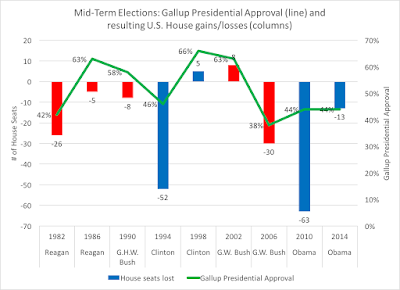 This chart has attracted some attention on Twitter. 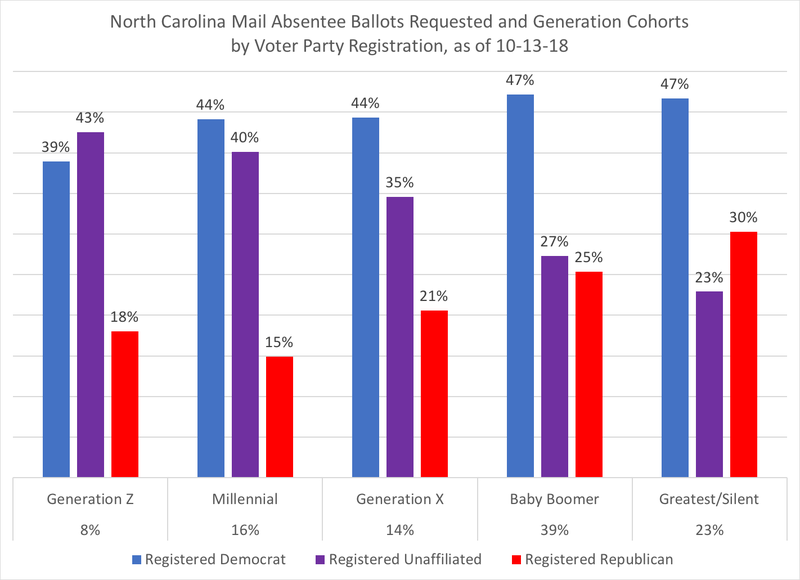 A word of caution: be careful assuming all reg Democrats are voting Democratic (older white Dems could be more conservative), & even more careful with reg Unaffiliated. They are partisans, but we don’t know which way they lean. But to see the % comparison performances to 4 years ago is pretty remarkable for registered Democrats (typically more absentee one-stop/in-person than by mail) and registered unaffiliated (typically more Election Day voters). 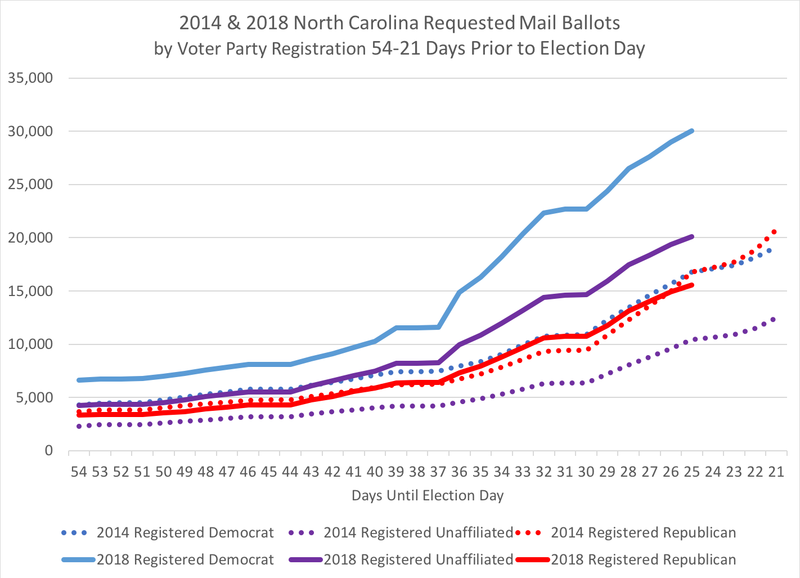 It will be important to watch how this trend continues over time, but traditionally GOP leads in mail absentee ballots. 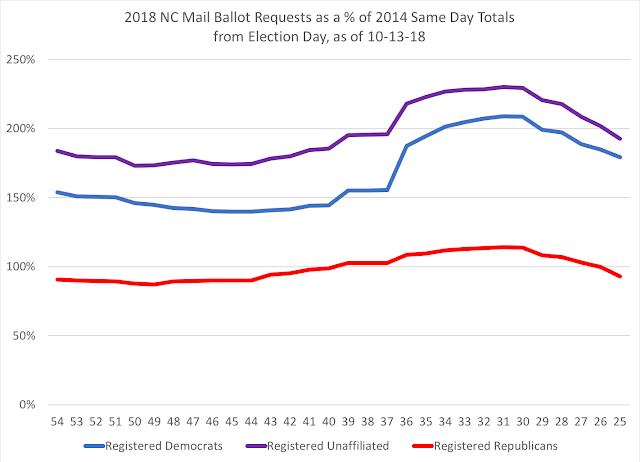 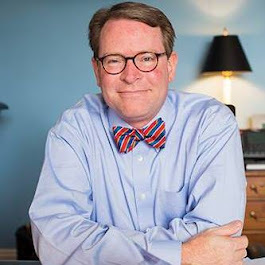 In 2014, this point before Election Day was when registered Republicans overtook registered Democrats to lead the remainder of the time for requested absentee mail ballots. 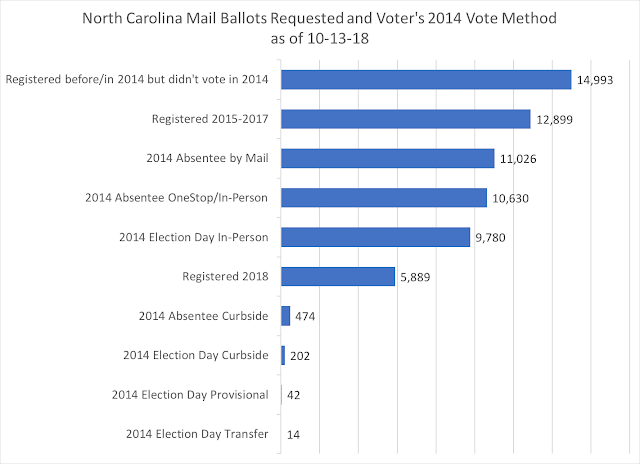 And finally, on the 25th Day from the 2014 Election, total North Carolina absentee mail ballots returned & accepted stood at 8,419. 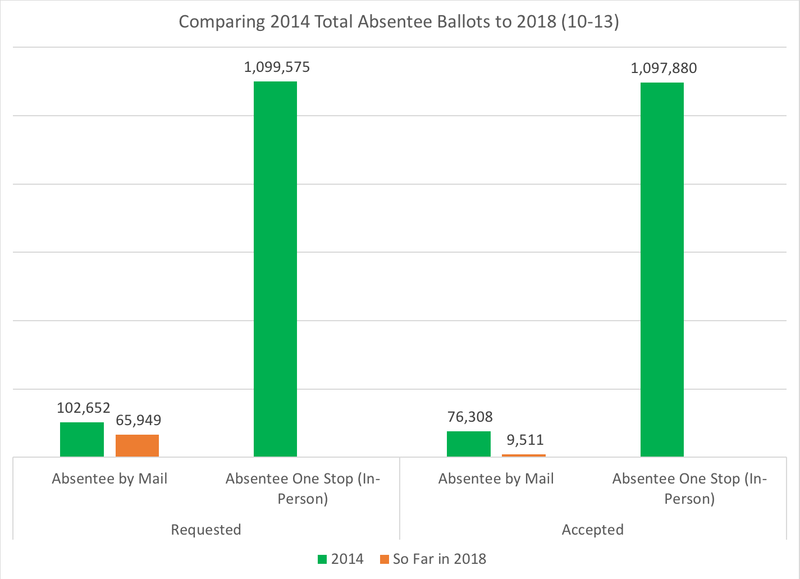 As of today, 2018’s #: 9,511. A percentage comparison to 4 years ago: 113%.